So why, you might ask, is this innocuous tuft of powder puff worthy of my hatred? First and foremost, it paints a bone-headedly sun-dappled portrait of 50s America – a period so rich in contradiction and darkness just below the thin surface of light, that I find it impossible to stomach the pure nostalgic fakery. Call it curmudgeonly, but even upon its first release, I responded to the picture with the same kind of jaded contempt that (at the time) made me cringe when I first saw “Star Wars” a year earlier. In retrospect and with the benefit of several helpings since that time, including the new Blu-Ray release, “Grease”, like “Star Wars”, sits there in cinema history – a perfect Easter Island-like moai of how, by whom, where, when and why movies started to go seriously awry and led to a decade (the 80s) that was replete with some of the most mind-numbingly empty movies of all time. Even ace film critic Pauline Kael abandoned the lively sexually-charged titles of her book collections of reviews and collectively titled her pieces during the early 80s as “State of the Art” – reflecting the soul-bereft technical proficiency and machine-tooled quality of the work during that period. In tandem with the above-mentioned, the second most important piece of ammunition for my derision is the simple fact that “Grease” is not especially well made. It’s definitely machine-tooled, but not in any aesthetically pleasing way. While many of the songs are not without the melodic qualities that popular music needs, the delivery of said pieces vocally and visually is either insipidly competent at best and at worst, downright dull. Olivia Newton-John, while suitably Sandra-Dee-like in her performance as the blonde goody-two-shoes who falls for the greasy bad-boy played by John Travolta, delivers all her vocals with the same lifeless range that vaulted her to the top of the A.M. charts during one of the most tunefully-challenged periods of mainstream music. Travolta’s singing is marginally better in that he attempts to infuse his clumsy warbling with something resembling pizzazz. The supporting cast is in better voice – notably Stockard Channing who delivers (in spite of her obvious over-age and flabby thighs), a musical performance that has EXACTLY what a musical needs in terms of vocal delivery – she has a great voice and lots of character. 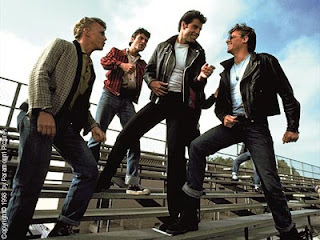 At the end of the day, I have no problem with fluff if it’s first-rate, but “Grease” – after several viewings over the years – seems (at least to my eyes) lacking the kind of style and oomph one normally equates with great movie musicals. There’s also something vaguely detestable about the “Happy Days” quality to the nostalgia. George Lucas went back to 1962 with the brilliant “American Graffiti”, but the movie captures a time of change so that the fun and frolics have a true bittersweet quality to them. “Grease” captures not much of anything, save for some poorly shot, cut and choreographed musicals numbers purporting to capture a period that doesn’t seem to exist in any world save for the one belched up by Kleiser and his factory workers. The recent Blu-Ray release of “Grease” is also a bit of a disappointment, too. Part of the problem is the source material since the movie is not especially well shot, but there also seems to be something not quite right about the transfer. After my considerable disappointment with the look of this Blu-Ray release, I compared the virtually identical DVD version. Surprisingly, the Blu-Ray disc doesn’t look much better than the up-rez that occurs when I play the DVD on the Blu-Ray player itself. The real surprise and best thing about the Blu-Ray release is the excellent commentary track by Kleiser and Birch. For a bad movie, a dreadful director and an unexciting choreographer, they actually sound like intelligent people and some of the insights into the production are informative and entertaining – not enough, alas, to change my mind about the picture itself, though. Ah, the hell with it. Call me a wet blanket and enjoy! “Grease” is available via Paramount Home Entertainment on Blu-Ray and DVD in a package titled “The Rockin’ Rydell Edition”.